The study of the CW which is one of Palestine’s most sophisticated wares ever produced included its typology, relative and absolute chronology, petrography and synchronization with other areas in the Eastern Mediterranean. This study was mainly based on numerous CW shapes from Tell Abu al-Kharaz and Pella (both in Jordan), but also from Tell el-cAjjul (Gaza, Palestine). 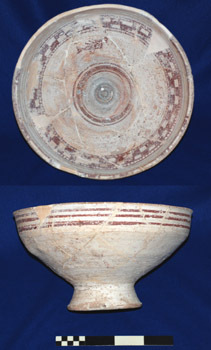 Six variants of CW could be classified: Proto-CW (PCW), CW Bichrome (CWB), Eggshell (ES), CW I, CW II, CW III, the last of which is difficult to distinguish from “common” ware with identical motifs which are typical for CW proper and which includes geometric patterns and metope decoration of stylized trees and animals. CW was produced from the MB III to the LB IA with the following diachronic distribution (Fischer’s terminology for the LB): MB III: PCW, CWB, ES, CW I; MB III/LB I: CWB, ES, CW I; LB IA: CWB, ES, CW II; LB IB: CW III. Fifteen selected radiocarbon dates show the following absolute time frame for two of the CW-types, namely ES and CW II: Tell Abu al-Kharaz (7 samples) from Phase V (LB IA): 1620-1424 B.C. (1s) / 1672-1394 (2s); Tell el-cAjjul (8 samples) from Horizons 5-4/3: 1640-1410 (2s). In addition to finds of CW in Lebanon, Israel, Jordan and Palestine there is no confirmed CW on Cyprus or in the Aegean. 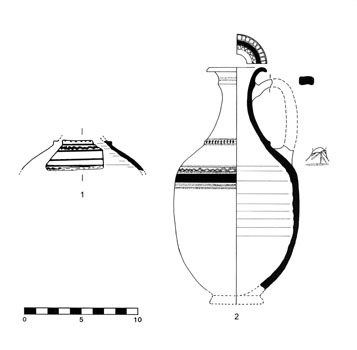 There is, however, a very important find of a PCW jug from Tell el-Dab‘a/‘Ezbet Helmi, which is the first ascertained find of CW ever in Egypt, with a relative date “e/2”, viz. late Hyksos (or early 18th Dyn.). This fits excellently with the proposed date of an earlier discovered and almost identical vessel from Tell Abu al-Kharaz from Phase IV/2 (MB III). All results are presented in numerous publications. The by far most important sites in the Transjordanian Jordan Valley during the MB and LB are from north to south: Pella, Tell Abu al-Kharaz and Tell Deir cAlla, all within some 40 km. In a joint publication (Fischer, P.M. ed. 2006) the directors of the excavations at these sites, S. Bourke, P.M. Fischer and G. van der Kooij, presented their material. The sites were synchronized locally, regionally and interculturally. It is obvious that this volume supported by another volume on the MB and LB of Tell Abu al-Kharaz (Fischer, P.M. 2006) is of major importance not only for the archaeology/chronology of the Jordan Valley and the Southern Levant but also for other related cultures such as those of Syria/Lebanon, Cyprus, Egypt and the Mycenaean sphere because of imports from these regions. Fischer’s revised terminology and chronology for the sub-division of the Late Bronze Age of the Southern Levant is used by all contributors. The interdisciplinary character of the publication is apparent. 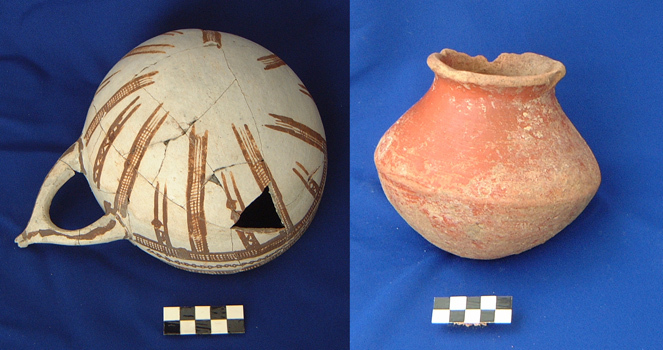 The integration of modern field archaeology and advanced scientific studies contributes to a better understanding of the dynamics of the vibrant societies of the Middle and Late Bronze Ages in the Eastern Mediterranean and the Near East. The renewed excavations at the cosmopolitan city of Tell el-cAjjul, Gaza, directed by the project director (Fischer) produced almost 1,000 imports from all over the Eastern Mediterranean. 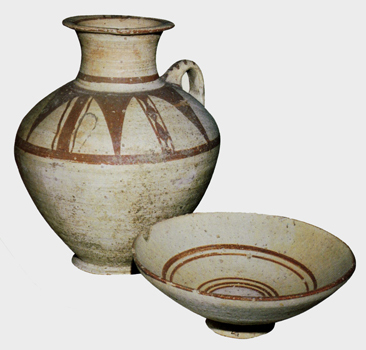 This enabled us to synchronize Cypriote, Levantine and Egyptian wares, and to present a typology/seriation of Cypriote White Slip I and II, both of which were exported to many cultures between roughly the 16th and the 13th centuries B.C. At the same time the programming of the database “MontAjjul” with all finds ever made at this site (Petrie’s and Fischer’s/Sadeq’s excavations) was completed and can be used by any scholars. 48 pumice samples from Tell el-cAjjul of which 45 are from H1(just below surface) to H5 (of eight horizons of which H8 is on bedrock) were analysed by INAA. Forty-one of these 45 are from Thera and the majority, namely 23 (78%) are from H5, and none derives from below H5. This supports the hypothesis that the Minoan eruption at Thera occurred pre-H5 (or at the beginning of H5). The stratigraphic context and the provenance of the Tell el-cAjjul pumice. 40 analyses by P.M. Fischer and M. Whitehouse with one of most sophisticated SIMS on the market, IMS 1270, of particles from the 1645 B.C. level in the GRIP ice core on Greenland did not demonstrate a Theran origin. Further samples could not yet be analyzed.